Palmetto Beach developed in the late 1800s and early 1900s around four cigar factories. It is located just south of Ybor City, which had also developed as a cigar industry center just eight years earlier. The area was platted in 1894 by the Tampa and Palmetto Beach Railway Company, an electric power/streetcar company. Established as “East Tampa,” the plat exhibited a street grid which is still evident today. Streets were named after Florida’s major developers (Plant, Flagler, and Chapin) and US presidents (Grant and Cleveland). The neighborhood’s early growth and development centered on three cigar factories constructed in the area during the mid- to late-1890s and a fourth cigar factory which was established here in 1915. Three of the cigar factories are still here today; two are occupied by other commercial uses and one is vacant. These are La Corina or Jose Escalante Factory at 202 S. 22nd Street; the Salvador Rodriguez Cigar Factory at 402 S. 22nd Street; and the V. Guerra, Diaz, and Company La Mega Cigar Factory at 201-205 N. 26th Street. Workers’ cottages and related commercial buildings surrounded these factories, resulting in a self-sustaining urban village, which remained so for many decades. An interesting ethnic mix of Spanish, Italian, German, and other nationalities added to the uniqueness of this community. Residences are primarily built in the Bungalow, Frame Vernacular, Masonry Vernacular, and Minimal Traditional styles. Commercial and institutional buildings are built in the Masonry Vernacular and Frame Vernacular styles, although two cigar factories represent the Renaissance Revival style and the school depicts the Spanish Colonial Revival style. Historically, the streets were paved with brick. But today, most of the streets are paved with asphalt. Only Clark Street and Harper Street still have brick paving. Stuart Street is wider than the others since the streetcar originally went along this street to DeSoto Park. The streets north of Linsey Street have sidewalks, but only on the north side. Linsey, Thrace and Gordon Streets do not have curbs or sidewalks. 22nd Street has sidewalks on both sides. Granite curbs were present along Clark, Corrinne, Harper, Stuart and most of 22nd Street. Most of the houses are set close to the street or sidewalks and close to each other. Palmetto Beach developed around the electric streetcar, cigar factories, and DeSoto Park. The streetcar, operated by the Tampa and Palmetto Beach Railway Company (that also platted East Tampa), provided access to the recreational area at DeSoto Park for other residential areas in Tampa (such as Tampa Heights and Seminole Heights). The streetcar line connected with Ybor City, West Tampa, and Ballast Park, along present-day 22nd Street, then turned east on Park Street (present-day Stuart Street), and terminated at DeSoto Park. The streetcar provided access from Palmetto Beach to the rest of Tampa, but it appears that most of the employment for Palmetto Beach residents was primarily within their own neighborhood. The Tampa and Palmetto Beach Railway Company (also known as the Tampa Suburban Street Car Company) was completed in October 1894, and sold in 1899 to the Tampa Electric Company. DeSoto Park was developed by the Tampa and Palmetto Beach Railway Company (circa 1895) a recreational area, accessed by their streetcar. A similar park at Ballast Point, on the Interbay peninsula, was also owned and developed by the electric company and accessed by streetcar. Tampa residents rode the streetcar for festive outings to the two parks. Picnics and great celebrations on holidays, such as the Fourth of July took place in DeSoto Park. According to a description from the mid-1890s, the DeSoto Park consisted of beautiful picnic grounds, a beach, a fishing dock, and a dance pavilion. The pavilion was built in 1895 by beer brewer Robert Mugge and operated by him until 1912 when the city took over the park. Clay pigeon shooting contests brought sharpshooters for competition. In 1898, DeSoto Park and the Palmetto Beach area served as a camp for American troops waiting to be deployed in the Spanish-American War. There were a large concentration of buildings around DeSoto Park. This included about 14 stores (one drug store) east and west of the park, many small shacks in fishing camps northeast of the park, two apartment buildings, the new East Tampa Public School (now DeSoto Elementary School, built in 1925) situated around the older school, a dance hall east of the park, and a new auditorium in the park (built in the late 1920s). 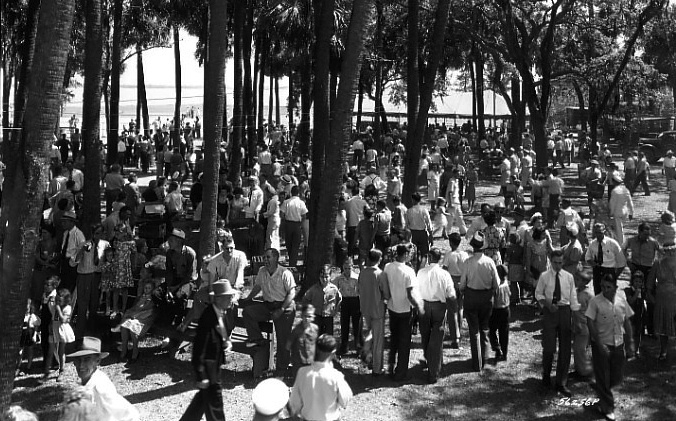 DeSoto Park also contained a small branch of the public library and was popular for its beach. In 1922, a thousand sport fans witnessed their first football game in the park. There was originally a natural beach at the south end of the park along McKay Bay, but a modern retaining wall has been built along the shoreline. The 1921 hurricane brought flood waters to Palmetto Beach, up to ten feet above normal. Homes, businesses, and factories were flooded. Cedar logs, traditionally floated from the Hillsborough River to the cigar box factories, rammed into houses causing their destruction. The stuccoed Spanish Colonial Revival style DeSoto Elementary School was completed in 1925, replacing the 1913 building that was damaged by the storm. Most of the new construction at and around DeSoto Park was probably a result of the damage to numerous buildings (including the dance pavilion at the park) from the 1921 hurricane which flooded Palmetto Beach. The great Florida land boom of 1920-1927 was driven by the advent of the automobile age and associated transportation improvements. The boom was immediately presaged by the first invasion of middle class camping vacationers known as Tin Can Tourists during the winter of 1919-1920, whom organized the Tin Can Tourists of the World the following year at DeSoto Park. The boom also brought extensive building activity to subdivisions platted the previous decade. Networks of highways were constructed to accommodate the growing automobile tourism. DeSoto Park offered the “Tin Canners” free campsites and nightly entertainment under a dance pavilion. Shower facilities and the street car service into Tampa represented then-modern conveniences. A bridge and causeway extending south and east from 22nd Street across the Hillsborough Bay was constructed, as was the dredging of a channel beneath the bridge to a depth of 40-feet. The dredged land was used to fill in the lower end of Hookers Point. Hillsborough Bay was essentially split into two bays; Hillsborough Bay was renamed McKay Bay north of the bridge and East Bay south of the bridge. The DeNarvaez Bridge (renamed Licata Bridge after its replacement in the mid-1970s) and causeway, completed during the winter of 1926-27, was a critical link in the long-awaited Tamiami Trail, a dramatic linkage between Tampa and Miami across the Everglades. This also provided easier access to the port area for shipyard workers living east and south of Hillsborough (McKay) Bay. Much of the Palmetto Beach land west of 20th Street was acquired by Texas Oil. Tampa Shipbuilding and Engineering Company, located south of Texas Oil, ranked among the largest of producers in the United States from World War I forward. The City of Tampa installed water mains throughout Palmetto Beach in the 1940s. The early 1950s continued to see local businesses thrive in Palmetto Beach, such as commercial fishing, seaboard shops, the Tampa Box factory, Senate Coffee, shipping, the shipyard, farming, Ware Furniture Company, the Portland Cement Company, the American Can Company (located north of the neighborhood), building contractors and a variety of smaller stores. The can factory produced cans for the fishing industry of the area and then produced ammunition shells during the war. A number of fishing docks, such as Miranda Brothers and Boomerang, were located along Bermuda Boulevard. Some are still there today, but in poor condition. The late 1950s brought an end to the cigar industry in the US, including those that had remained in operation in Tampa. Cigar factories closed with Fidel Castro’s takeover of Cuba and an American embargo on Cuban tobacco in the early 1960s. Major shipping development took place in the area as well as related development associated with the 1970s extension of the interstate highway system through the region. Business US 41 was re-routed from 22nd Street west to 20th Street in the past decade. 22nd Street is now closed at Marconi Street but can be accessed at Durham Street. Although this eliminated the heavy traffic along 22nd Street, especially large trucks, it also altered the once busy commercial feeling of the 22nd Street corridor. 3. by making the property eligible for Federal financial incentives in tax credits and grants for historic preservation. If a property is a contributing resource in the district, it is already fully listed in the National Register of Historic Places, and is given the same level of consideration as properties that are individually listed. Additional information about a property can be submitted to the Florida Master Site File, the statewide inventory of historical resources. To see if your property is a “contributing building” of the Palmetto Beach National Historic District, view the map here. With community support, the historic district nomination process was initiated in conjunction with planning for the I-4/Selmon Connector in 2008. The Florida Department of Transportation prepared the nomination on our behalf, which contains quite detailed documentation. View the application here. For more information about the National Register, visit Florida Heritage. Source: Palmetto Beach Historic District Proposal of Properties in Florida for Nomination to the National Register of Historic Places, 2009.